The Petit Basset Griffon Vendéen is one of numerous small French dogs and originated in the 16th century. He’s a smaller version of the Griffon Vendéen. He was designed to hunt small animals including hare and rabbit in the difficult local terrain of the area. “Petit” means small and “Basset” means low to the ground. “Griffon” means wiry or rough (as per his coat) and Vendéen is the French place of origin. 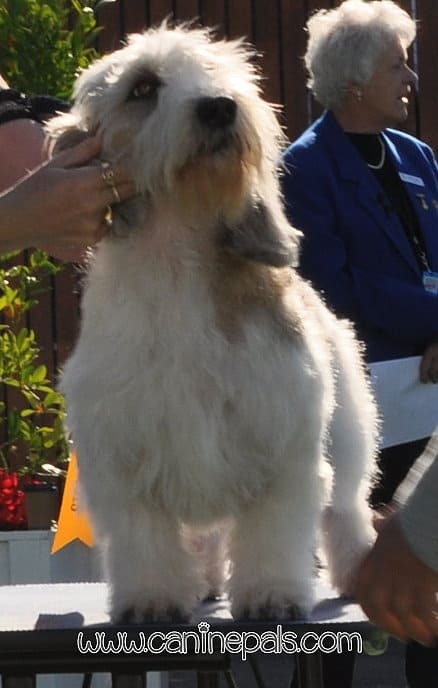 His coat’s colour is usually white with markings that can be a combination of tricolour, grizzle, lemon, black, orange or sable and they make him easy to see in the field. He’s an extroverted, happy, confident dog and needs a fenced off area to burn off energy. He is certainly not one to lay around doing nothing. If he’s upset, he may use his “hound voice” or find amusements of his own. He’s willing to please. His harsh coat needs proper weekly brushing. He’s 13 – 15 inches high.